Japan's newly-elected opposition leader, Shinzo Abe, has visited a controversial war shrine in Tokyo, in a move likely to antagonise neighbours. The Liberal Democratic Party (LDP) leader said he was paying his respects to those who died during the war. Mr Abe, who became LDP chief in September, looks strongly placed to become the next prime minister. China and South Korea have protested previous visits to the shrine, seen as a symbol of Japan's military past. 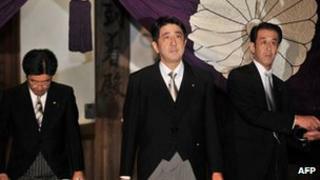 Mr Abe's visit to the Yasukuni shrine - which honours Japan's war dead, including war criminals - also comes amid Japan's ongoing, separate territorial rows with China and South Korea. "I paid a visit as president of the Liberal Democratic Party to show respect to the spirits of the war dead who gave their lives for the country," Mr Abe told reporters after his visit. "In view of current Japan-China, Japan-South Korea relations, it's better not to say whether I will visit if I become prime minister," he added. When asked about the visit, Chinese foreign ministry spokesman Hong Lei said that Japan should strictly abide by its promise on historical issues, Xinhua news agency reports. Mr Abe was Japan's prime minister in 2006 - the youngest elected since World War II. However he stepped down a year later citing ill health, as support for his administration plummeted. He did not visit the shrine while he was prime minister.